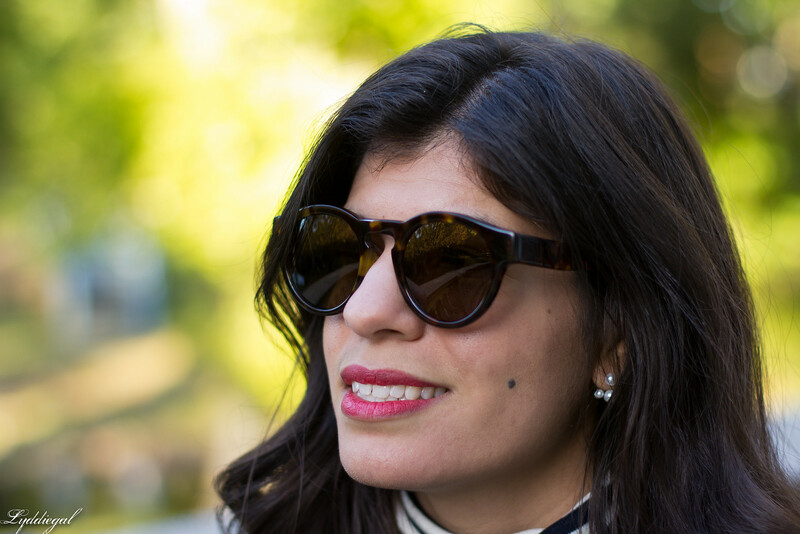 I'm delighted to be sharing a new-to-me eyewear brand, Sicky. The frames are designed in Malibu, crafted in Japan, and offer standout silhouettes and unique takes on classics. I decided to choose the CS S10 frames because the round shape is different than any pair I have, and I've always shied away from the shape as I worried it didn't suit me. However the these frames removed that doubt. The sizing is perfect, and I'm smitten with the tortoise. Sicky offers a wide range of frames from the subtle standout, to the attention getters, and I hope to add more pieces from their collection to my own. This post is sponsored by Sicky, thanks for supporting the brands who support Chic on the Cheap. Love your new frames! They definitely suit your face and your lovely work outfit! That lace skirt is divine! Red, black and white are one of my all-time favorite color combinations and this is absolutely striking on you! 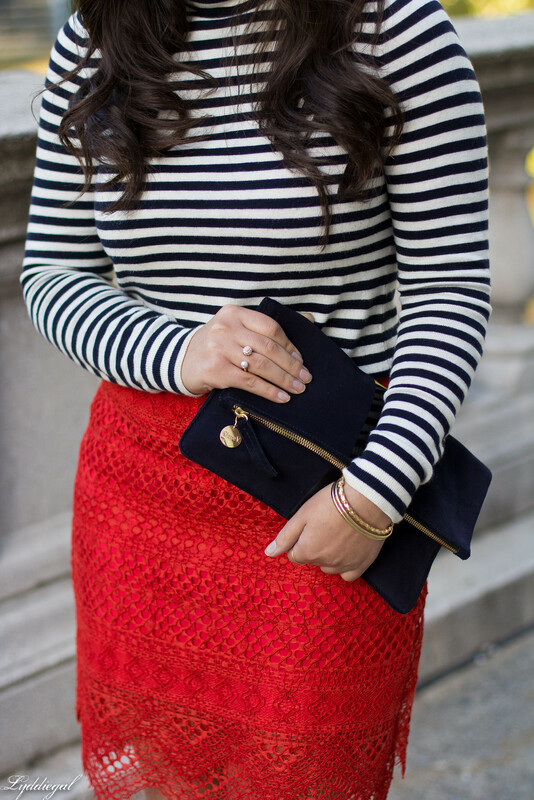 I love that the texture of the skirt totally rocks the striped shirt! LOOOOVE those!!! The shape is so perfect, it suits you! And I love that bright red skirt! While I admittedly don't find the brand name particularly appealing, I do love these frames on you - the shape is definitely challenging but it suits you really well! (I'm still trying to find a similar pair that suits my face, but haven't had much luck yet.) That said, it's your gorgeous red lace skirt that really stands out in this look for me - what an eye-catching piece! Love the glasses. Sounds like a great brand. Really loving this red lace skirt though!! So pretty with your stripes. As you might have guessed, I am a huge fan of sunglasses and love to be introduced to new brands. 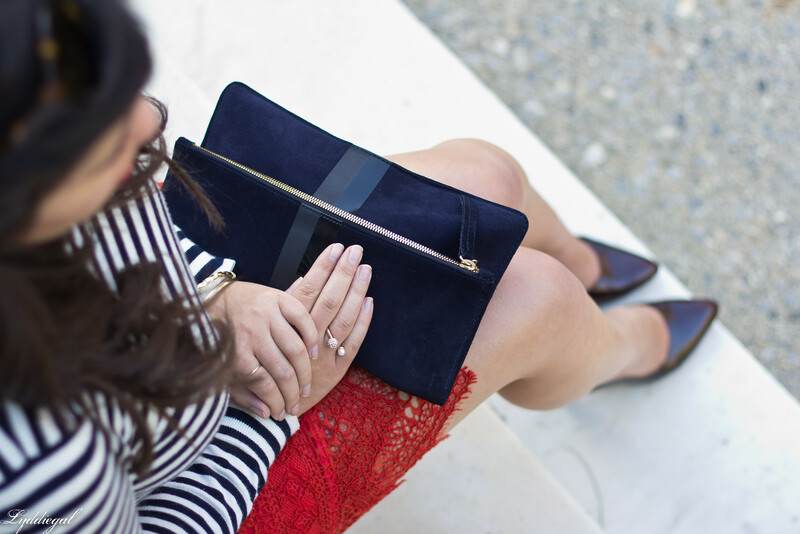 I really love these and the pairing with this pretty lace pencil skirt and the stripes! Never heard of the brand..but anything made in Japan for me exudes quality and craftmanship. 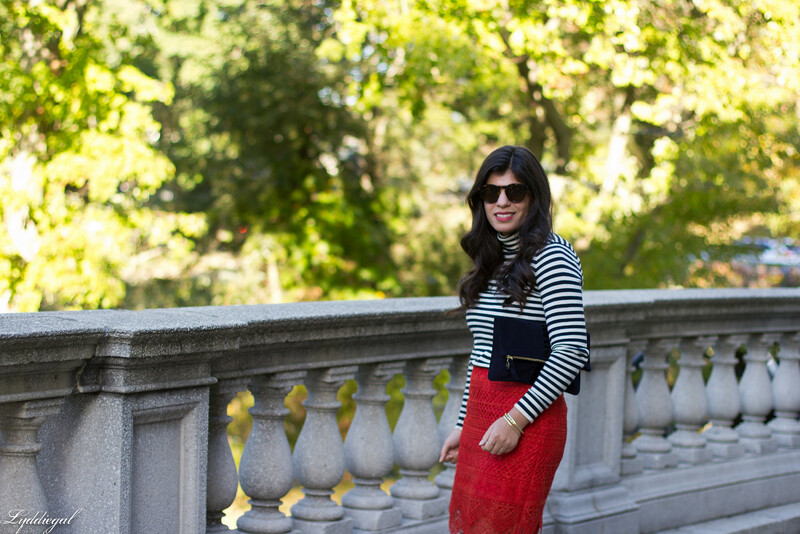 The sunnies look fabulous and do you in that bright red. 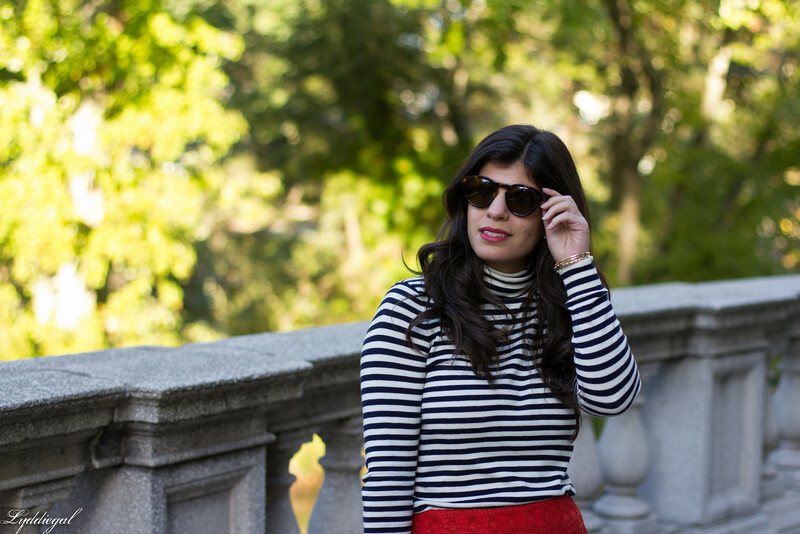 Super cute sunglasses and loving the pop of red. Is it just me or is that sort of a bizarre company/brand name? Either way, the sunglasses are super cute. stunning look, love that skirt. I love this entire outfit. SO cute! And your new sunglasses are fab! The sunglasses are very cool! Glasses are such a great accessory to every classy outfit- looking amazing as always!